The Satake PLSB Laboratory Sifter provides a rapid method of carrying out particle size determinations. The assessment of particle size of intermediate or finished products assists the Process Control Engineer to keep his plant running at optimum efficiency. 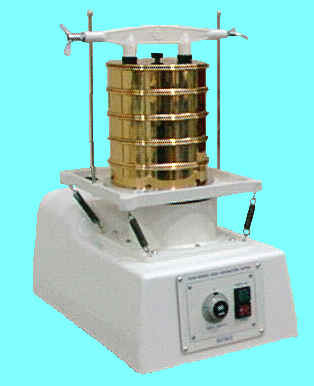 A Series 2000 Laboratory Sifter is designed to use either a stack of up to four 255mm wooden sieves with lid and receiver or four 200mm diameter Endecott brass sieves. The sieves are secured to the table of the sifter with a beam and quick release bolts. The sifter oscillates the table and nest of sieves attached to it in a planetary motion similar to that of sifters commonly used in the Flour Milling and other industries. The sifter is fitted with a five minute timer (60 minute timer optional), power indicator light and master switch. The sealed design is hygienic and allows easy cleaning.